Don’t get us wrong—carefully crafted product descriptions are vital to selling your products online, but they aren’t the first thing that is going to grab your customer’s attention. The first and, arguably, most important things your customer sees are your product images. Your images do far more than simply show off your product. They instill trust in your products and your business, further enticing customers to buy from your online store. With so much at stake with your product photography, you don’t want to waste time and money on images that won’t do anything for your bottom line. To help you nail your product images, we’ve created an eCommerce guide with helpful tips for engaging product photography. If you know little about photography or don’t feel like you have the time to shoot your own products, hiring a professional may be the way to go. With a professional, you don’t have to worry about finding the necessary equipment or spending time learning photography best practices. The downside is that professional photographers aren’t cheap, and you may not even own the rights to your photos. If you fail to do your research, you could end up with a photographer who isn’t a good fit for your business! The DIY approach is common for startups and those working with limited budgets. Even if you’re new to the industry, you can achieve high-quality photos if you take the time to learn a few tips of the trade. The obvious disadvantage is that you may not want to take time away from other tasks to learn how to properly photograph your products. Engaging photography isn’t guaranteed just because you hire a professional. The truth is that you know your products and your customers better than anyone else, and it’s up to you to show your products in the best way. Every eCommerce retailer has the standard white-background product image shot. We aren’t knocking this kind of shot necessarily. In fact, it’s important to not have distractions in certain shots and to simply showcase the product on its own. But, if you want to truly engage customers, you will need to have a variety of product images in your arsenal. For example, shooting your product from different angles, showing a person using the item in action, or, better yet—get a video of the item being used. The consumer can’t touch or test your product online, so it’s up to you to answer their questions with your images. With this in mind, you are on your way to producing product images that sell. For online stores that are selling clothes, hiring a stylist to work with their photographer is a no-brainer. Stylists know some pretty neat tips and tricks to get products looking amazing for photoshoots. Stylists aren’t just limited to clothing items. Local restaurants frequently enlist food stylists to make their food look irresistible to consumers. So, regardless of what you sell, you may want to consider hiring a stylist because they can take your product images from average to engaging with just a few simple tweaks. Most eCommerce merchants know that low-quality images are bad and will end up deterring customers from making a purchase. However, authentic photos don’t have to mean low-quality, and they can be more engaging to consumers than your professional-looking photos. For example, check out this photograph that Halo Top Creamery featured on their Instagram page (their vanilla bean ice cream is amazing, by the way). 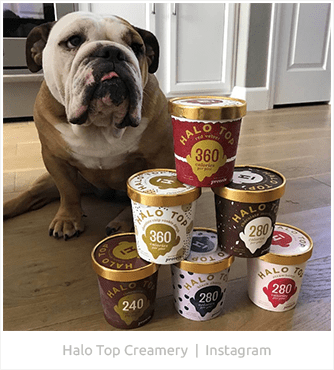 The product is still the main focus of the image, but the dog adds an air of authenticity and warmth that engages consumers. Although a professional photographer is convenient, it isn’t necessary to achieve engaging product images that convert shoppers into buyers. The most engaging photos are those that instill trust in consumers, answer their unasked questions, and entice shoppers to make a purchase. Springbot delivers an eCommerce marketing platform to small and medium businesses on BigCommerce, Magento, and Shopify to combines the power of marketing automation and marketing analytics. We integrate and make simple the data, content, and multi-channel marketing tools (social, online, email, etc.) you need to drive more traffic, conversions, and revenue. Find out how your store stacks up against your eCommerce peers with Springbot’s new free tool, the eCommerce Scorecard. Next PostNext EYStudios announces its new status as an Enterprise Level partner with Magento.